This subject investigates the assessment of Chief Igbinedion by the society in which he operates having dealt extensively on him and his contributions to societal development. Indeed, reference has been made to his worldwide philanthropic gestures and his colossal business empire from which derives the milk of his insurmountable kindness. 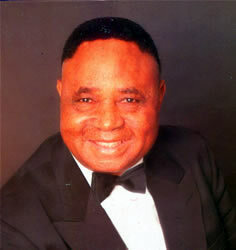 But who is Sir (Chiet) Dr. Gabriel Osawaru Igbinedion and what has been his relevance to society? A glance at a part of the citation read on him by the University of Calabar during the award in January 1992 would perhaps provide some answer to this question. "Sir Gabriel Osawaru Igbinedion, the Esama of Benin, a man who has lived a creed, a man whose life as a celebrated philanthropist, a brilliant industrialist, and a humanist, has endeared him not only. to Nigerians of all creed but to the entire human race. 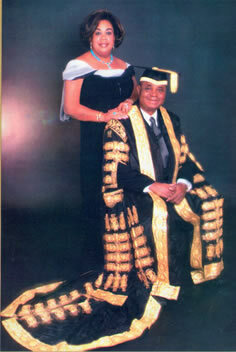 By his word and deeds he has shown himself to be worthy of recognition and honour by the University of Calabar.
" the success story of Sir Igbinedion as the most distinguished humanist started with Okunbor, the founder of the Igbinedion dynasty, in about 1754 A.D. At birth, destiny gave the family a name; Igbinedion, which literally means a divine light. Okunbor, we are told, was informed that six generations after him a son would be born, a star, that would rule the air, land and sea and his services would improve the fortunes of mankind... it is not possible in this small package to capture all the aspects of the enigma called Sir Igbinedion, for his life is a story of vast socio-economic and religious transformations of his ancestral homeland; Okada, a proof of the enduring principles of doggedness as a basis of human upliftment from poverty to the pinnacle of fame '"
Much of what is known and has been said about Chief Igbinedion is also contained in the University of Calabar citation reproduced in part above. 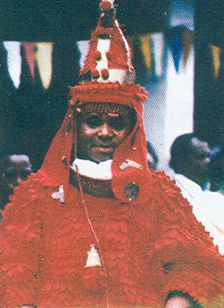 Chief Igbinedion is a product of humble yet respectable origins. He rose to be a world citizen of rare fame; giving up parts of his fortune in philanthropic gestures with such abundant ease that usually amazes the rich and the poor alike. "If you heard my history, you will notice the kind of hardship I went through for survival. I would rather say it is God that directs my footpath. I listen to God all the time ... I believe that when you have it (money) it is the less privileged people that should benefit. They may call you names but you should satisfy your conscience that you have helped somebody." Chief Igbinedion's willingness to share his blessings with the less fortunate as an area of research is now a beaten track. What needs to be talked about is the way the people around him regard his attitude to life. An effort in this direction was made through the public interviews conducted in the course of this docu­mentary biography. Of the 338 persons interviewed randomly, 45 were employees of Chief Igbinedion, 10 were fellow traditional chiefs, 28 were full-time businessmen of varying ranks, 43 were market women, 12 were former class­mates, school mates and close youth associates, 55 were petty traders, 11 were top ranking politicians and ex-politicians, 50 from the University community including the academic and non-academic staff and students, and 74 spread across the board comprising the low income earners and the unemployed. Resort; three from the domestic servants and drivers and five persons from the general pool. The ten traditional chiefs interviewed comprised six Eghaevonore chiefs and four Eghaevonogbe chiefs. Two of the chiefs are senior to Esama in rank while the other eight are junior, yet very prominent chiefs. Of the 28 businessmen interviewed seven of them are still close business associates of Chief Igbinedion while the remaining 21 have had cause to do business with him over the years. The 43 market women were those who trade- in wares in Benin and Okada markets, notably the Ekiosa, Ogiso, Edaiken, Ozigbo markets in Benin City and the Okada market in Okada town. The 12 former classmates or school mates or early close associates include four who still interact with Chief Igbinedion almost on daily basis. The others were those he related with him in his days as a messenger in the Benin City Council and as a police constable in the Nigeria Police Force. The 55 male petty traders were drawn essentially from the Ring Road - Lagos Street shopping area; Mission Road and New Benin Market area and the Uwelu and Evbareke spare parts markets, interviewing at least ten persons in each market area. The eleven politicians and ex-politicians comprise four that have worked closely with Chief Igbinedion in the same political camp and are still close to him and seven that were members of the opposing political grouping. The University community presented a very interesting collection of conflicting yet constructive opinions about Chief Igbinedion. Three of those interviewed were senior non-academic staff, seven academic staff, and the remaining 40 were students in various levels. The last 74 of the group interviewed were randomly chosen among city dwellers drawn from the rank and file of Benin City. The interviews were conducted in a manner not suggestive of any intention to put things on record, but rather they were conducted in a relaxed atmosphere to enhance in the interviewee the freedom of expression. The results of the interviews indicated the following trend. Of the 40 Nigerian employees of Chief Igbinedion 32 spoke quite pleasantly of him reflecting a percentage of 80 while all of the five expatriates were happy with their Chairman making a 100 per cent performance for the group. The four Eghaevonogbe chiefs interviewed were divided in their opinions with 50 per cent for and 50 per cent against; while two of the six Eghaevonore chiefs had friendly impressions of the Esama. The businessmen interviewed showed an 82.4 per cent in favour and all the twelve classmates or old school associates could only remember the good old imes they had with the then young, energetic Osawaru Igbinedion, which is a 100 per cent mark for the Esama. Some of the former classmates interviewed include Messrs. Osawaru Ezekiel, and S.A. Gbajumo. Also interviewed was his childhood associate and now his legal adviser, Alfred Eghobamien, Esq. SAN, who was full of admiration for the efforts and achievements of Chief Igbinedion. The choice of the political associates was influenced by the need to identify those that were of status and were close enough to Chief Igbinedion to present a candid opinion. To be able to do this the eleven erstwhile political associates were chosen on the basis of their past or present association with the Chief. Some who were in a previous opposing political camp who later became members of the same camp with Chief Igbinedion gave reasons for switching sides and their impressions of the Esama as a political godfather. Others who were initially in the same political grouping with Chief Igbinedion who later moved to another camp also aired their opinions. Of the eleven political associates, four were picked from the same political party with the Esama and seven from the opposing party. Three of the four in the same camp had pleasant impressions about the Chief particularly in areas of party leadership and control showing a 75 per cent performance in his favour. Of the seven interviewed in the other camp four or 57.1 per cent spoke well of Chief Igbinedion while the others were sceptical of his political ambitions. The actual public opinion of Chief Igbinedion was best derived from the impressions of the market women, petty traders, university workers and students and the generality of the public. Thirty-eight of the forty three market women interviewed spoke favourably across the board about Chief Igbinedion, reflecting an 88.3 per cent in his favour. The questions posed ranged from the Esama's philanthropic gestures to his political aspirations. The general impressions were that Chief Igbinedion was a kind-hearted man of God. The petty traders comprising both men and women expressed views similar to those of the market women. The 55 of them interviewed presented a 90.9 per cent showing in favour of the Esama. Only five of them spoke against the Esama. The opinion of the University community about Chief Igbinedion was objective and impressive. His person was assessed and his activities examined; and the end result was a candid evaluation of the man - the Esama of Benin. Of the 50 members of the University community interviewed comprising academic, non-academic staff and students, 80 per cent spoke in favour of Chief Igbinedion particularly in respect to his contributions to the development of the society and his philanthropic gestures. The University opinion was quite important because it was based as usual on a critical and articulate examination of the issues at stake. It was even more interesting in the sense that each of the groups interviewed made separate well thought out contributions to the research. All of the three non-academic staff contacted scored Chief Igbinedion quite highly as well as four of the seven academic staff and 32 of the 40 students interviewed. Perhaps the most interesting group of all those contacted in the opinion sampling exercise was the rank and file of the public interviewed on the golf course, in local hotels, clubs, and mechanic workshops. Their views of Chief Igbinedion comprised a rather heterogeneous yet reasonable combination of societal opinions. On the whole, 74 persons were interviewed in this group and of this number 90.5 per cent spoke favourably of the Esama. The issues raised include Chief Igbinedion's philanthropic gestures, contributions to the development of the society, his person and his activities in general. A sizeable part of this percentage commended the Esama for the much he has done for the society and prayed fervently that he should ontinue to be in the position to do more. One important result of this interview is that Chief Igbinedion's contributions to society, be it through his philanthropy or otherwise are fully appreciated by all. The research showed an 85.7 per cent acceptance and appreciation of the Esama's gestures. His employees appreciate his kindness to them; his fellow traditional chiefs speak well of him; his. business associates are impressed with him; his former class and school mates only remember all that is good about him; his fellow politicians admire his leadership qualities; the University community both in and outside Nigeria acknowledge his importance to society; the market women, petty traders and the rank and file of the society are all united in their appreciation of and praise for Chief Igbinedion. How many Igbinedions has the world had; how many of his type are in the world today and how many of his type can the world boast of tomorrow? There is no doubt that Chief Gabriel Osawaru Igbinedion, the Esama of Benin, has lived a creed.